Opelika, AL – With APR’s Annual Global Distributor Conference only a week away, APR provides a preview of what is to come for 2014 and beyond. Building on a successful 2013 which saw more new Engine Control Unit upgrade releases than any other year and the launch of the heavily anticipated Smart Device Mobile Application, APR is enhancing and refining its business even further to bring many new product lines and significant in house manufacturing in its soon to be completed 40,000 sq ft manufacturing facility addition at the Global Headquarters in Opelika, AL USA. In addition, APR will continue to move away from wholesale distribution products not branded, manufactured or designed by APR. 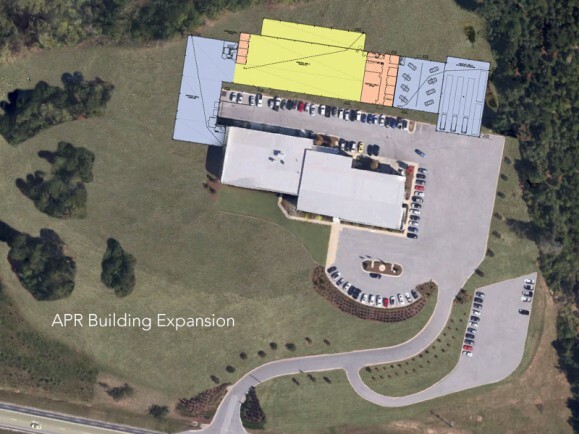 The new manufacturing facility will offer many new product lines in areas that APR has traditionally sourced through third party vendors or as private label agreements and pave the way for innovative new products solely in the control of APR’s engineering teams and manufacturing experts. APR’s engineering teams have been very busy designing new products and redesigning existing products in order to provide a completely APR controlled modification experience for late model VW Group vehicles. Although the size of the new production staff required is not yet determined, a round of new staff hiring will begin soon to take the new products from prototyping and testing into manufacturing. Joel McKay, Director of Engineering relayed, “I am very proud of our Hardware Engineering Team for their efforts in designing and testing a very ambitious line of new products. Instituting the manufacturing and quality control processes midyear will be the next challenge, but the team has begun preparation and is confident they’ll be raising the bar with these new offerings.” With more information available at the Distributor Conference at the end of February, expect it to be one of the most important conferences in the company’s history. In addition to moving a large portion of manufacturing in house, reliance on other brands to support APR’s traditional product line of engine performance is no longer necessary. Although APR maintains a great relationship with partners such as Volkswagen Racing UK and DXD Racing Clutches, APR will no longer offer these ranges through its worldwide dealer network. “We have really enjoyed the experience of working with these companies for braking, suspension and clutch products. We have made many lasting relationships through the APR Volkswagen Racing Cup and have offered a real value to our clients and dealers. Even more interesting to me however, is the opportunity to develop many of these products on our own after so much experience with such great partners”, said Keith Lucas, Vice President. The 2014 APR Distributor Conference takes place the weekend of February 22nd. In years past, the Distributor Conference has been the place to announce future projects and products. APR’s dealer network does an excellent job of informing our clients of what transpires during the conference and APR will provide first hand information throughout the weekend. Please visit www.goapr.com for up to date announcements and releases from APR’s 2014 Distributor Conference.